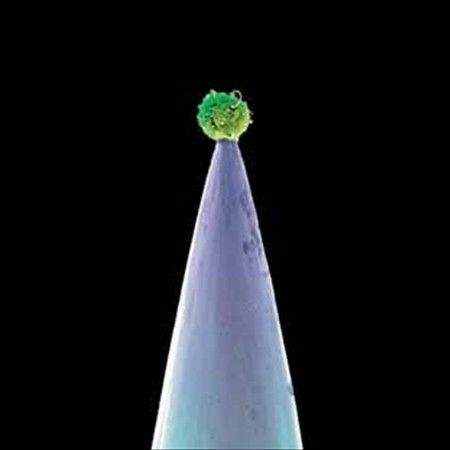 Peter Gabriel has spent most of his musical career performing a nerve- wracking, if exhilarating, high-wire act. Originally, a founding member of prog-rockers Genesis, then a solo superstar sporting a more tough-minded approach, he’s constantly walking between muscular funk-rock, and stuff that can be terribly arty and jarringly pretentious. With the new release, “New Blood,” he ups the ante on this tightrope walk. Here, Gabriel redoes a bunch of his older songs, with accompaniment from an orchestra and plenty of female voices. Some of the time, this aerial ballet works quite well. Often, though, this singer-songwriter teeters and falls to his death as the audience screams. You can be forgiven if, upon hearing about this record, you get a ‘Spinal Tap’ shiver. You know, like when David St, Hubbins says he ‘always wanted to do a collection of his songs with the London Symphony Orchestra’? But it’s not quite that nutty. Gabriel’s work has often tended toward the symphonic, so he’s not grafting strings onto some wonky three chord tunes here. The song “The Rhythm Of The Heat,” for example, shows how well this approach, this re-imagining, can work. With the Bernard Hermann-esque sawing of cellos for foundation, Gabriel’s wonderfully-distressed voice is prodded into even more urgency and panic than he summoned up on the original version, on his Security album. Drama and dissonance are the watchwords here and the female background vocals add to it. It’s just terrific. “Mercy Street,” Gabriel’s homage to suicidal poet Anne Sexton, also benefits from its new, string-y setting. The synths and keyboards used in the So rendition, here are replaced by strings, woodwinds and female voices, and they bring a warmth and delicacy to this gorgeous ballad, somehow making its sense of anomie and dislocation even more vivid than on the otherwise admirable studio version. The new version of “Digging In The Dirt,” however, illustrates the limits of Gabriel’s new approach, as he even tries to class up songs that once had the right amount of sweat and sonic sleaze. One of the best, certainly the nastiest song on the man’s 1992 release, Us, ‘Digging,’ with its grungy electronics and rattlesnake percussion, convincingly told the tale of an angry couple ready to kill each other during the course of a car ride. Here, couched in strings and wah wah horns that are way too theatrical and comically-menacing, this once-reptilian rocker has lost all its bite. You can almost see Gabriel twirling a Snidely Whiplash mustache, ready to tie an innocent damsel to a railroad track. It’s the worst thing he could’ve done; made this scary song unintentionally funny. And, as magical a tune as “In Your Eyes” remains, it’s been done to perfection-or to death-take your pick. Revived here, in a classical vein, full of women’s voices serving as counterpoint, this new recording is simply redundant. It was perfect the way it was originally done, this iconic tune about middle-age exhaustion and the moments of grace that can provide some temporary relief. Plus, Gabriel’s vocal here is so similar to the original, it sounds like he just dropped out the original instruments and added an orchestra. For a man, who in the past, seemed so interested in pushing the pop form, in not repeating himself, it’s infuriating that he’s now tossing off his most beloved hit, with nothing new to add to it. Gabriel’s never been a typical heritage artist, no hack trying to squeeze a few more dollars out the faithful on some shakedown Greatest Hits tour. Why is he dancing so close to this area now? And why is he damaging the memory of his magical “Eyes,” by releasing it yet again, in such a lackluster form? To his credit, Gabriel edits out the usual self-congratulatory applause from the audience. Which not only scores him points in the modesty category, but adds real tension, as the songs move along and (often) gather steam. Still, despite two new numbers near the end of this album, “New Blood” feels, despite it’s occasional avant-garde touches, like another holding pattern from an artist who has not been particularly prolific since his 80s commercial heyday. Maybe it’s time for the guy to pull a Neil Young or something. Write some tunes quickly, record them just as fast and get them out, warts and all. Gabriel’s increasingly slow, self-important release pace, his scant output and numerous compilation albums seem to imply that his most productive days are behind him. Orchestra or not, ‘new’ arrangements be damned, this is still, essentially, just another greatest hits album. And, at his best and most bracing? Quite often throughout his distinguished career? Peter Gabriel has proven that he’s just too damned good for that.